Before the recent Ebola outbreak Sam travels to postwar Liberia to discover how surf tourism is helping to revive the economy in Robertsport. The viewer is left with a powerful example of how surfing can be a force for positive change in West Africa, and surf travellers will likely be the first tourists back to Liberia after the Ebola crisis. Hainan is a small subtropical island in the South China Sea with incredible surfing waves between November and March, and a vibrant, growing local surf scene. Sam first visited Hainan in 2003. 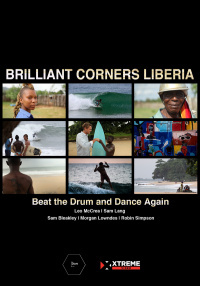 Before the recent Ebola outbreak Sam travels to postwar Liberia to discover how surf tourism is helping to revive the economy in Robertsport, just three hours outside the capital Monrovia. Sam catches up with an old friend Dominic, whom he first met following a visit in 2006. On that first trip Sam also befriend Morris, who learnt to surf on Sams board. Now Morris is at the heart of the growing local surf culture, and the proud face of a new Liberia. In partnership with two Californians, the locals run a surf club, shape wooden boards and work at the Kwepuhna Retreat, a guesthouse for surf tourists. The allure is powerful Robertsport has one of the best waves in Africa, and the locals are rapidly becoming top class African surfers. The sport offers a wonderful healing process following the trauma of war. But there are many challenges to tackle the bittersweet memory of war, the fear factor of coming to Liberia, and providing enough surfing equipment for the growing local scene. Sam meets the Mama Liberia Sewing Cooperative, making surfboard bags and satchels for tourists, and empowering women within the community. Education and healthcare remain key issues for Robertsport, and surfing is leading the way in developing the region.